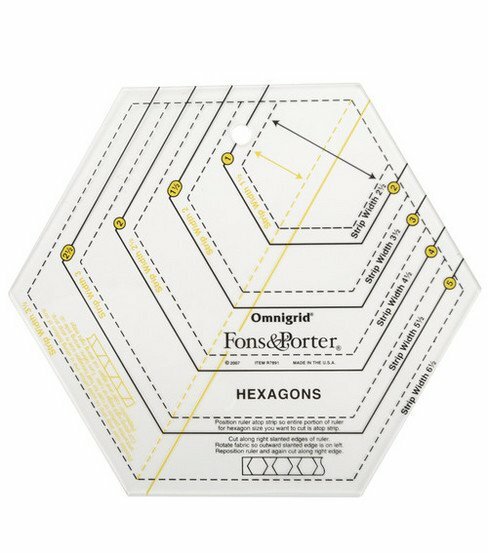 The Fons & Porter Hexagon Ruler is designed to cut the hexagon ranging from 2 to 6 inches tall and half hexagons from 1 to 3 inches. This acrylic quilt ruler has multiple size templates and dual colored markings that give measurements accurately. Use the easy-to-follow instructions and illustrated images to experiment with different creative ideas to combine these shaped hexagons with other shapes. Suitable to use with both the Fons & Porter Triangle Ruler and 60-degree Diamond Ruler.